Sharks are known to many from the famous movie of JAWS, making their reputation bad in front of human, who knows the as the bad animals who like to prey upon them. Although facts have shown otherwise, this key species plays an important role as an ultimate predator and nowadays still being hunted until the point of near extinction. It is inevitable to say that the presence of shark is very vital in in the ocean ecosystem. Similar fate has been happening to Manta Rays, one of protected species of rays, which holds high economical value for marine tourism. They are being hunted by fishermen in the ocean. 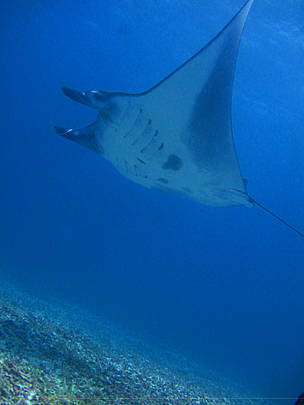 Both sharks and Manta Rays share similar ecological aspects such as wide distributions from shallow continental shelf, continental slope to deep sea. The continuous hunting on Elasmobranchii – that are sharks and rays – have been a major issues on international scale since 2013. This issue has sprung up after various species of shark and Manta Rays are included on Appendix II Convention on International Trade in Endangered Species (CITES). The inclusion of shark and Manta Rays in CITES coincidentally occur at the same timeframe with the overexploitation of various species of shark and rays, be it for target or bycatch. If this continues, drastic decrease of shark and rays population will be inevitable, and it needs a long time to recover. The health of ocean and fisheries really depend on the presence of shark and rays. With their slow growth, they need years to reach maturity point (Hoeve, 1988), both of these species needs real action from all parties for the sake of Indonesian economic fisheries. The lack of scientific information regarding shark and rays resource in Indonesia makes it harder to implement a conservation and management effort sustainably. Therefore, WWF-Indonesia has worked together with Indonesian Ministry of Marine Affairs and Fisheries to hold a National Symposium on Shark & Rays and will also be available to public. This scientific forum eventually will be one effort to compiles various studies on shark and rays resources in Indonesia. The result from this National Symposium also hopefully could be used as a substance to further support National Plan of Action for Shark and Ray. Encouraging trade quota and export ban to overseas countries for shark and rays; establishment of shark and ray conservation areas across Indonesia; to create a guidebook on handing of shark as bycatch are several conservation efforts that have been implemented. The data from the symposium hopefully will strengthen the ongoing effort to conserve the population of shark and rays in Indonesia. For further information on National Symposium of Shark and Rays, a leaflet could be downloaded here.